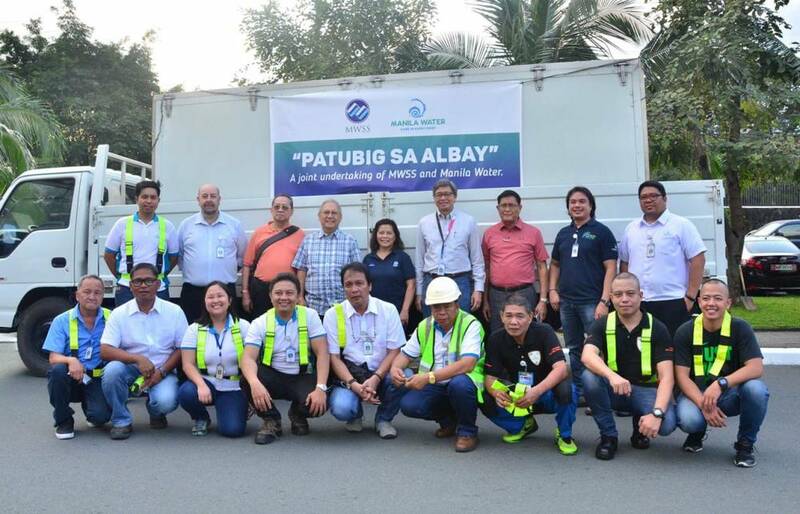 Mobile water treatment facilities come to Albay’s aid | Manila Water Company, Inc.
Photo above shows the Manila Water MTP team with the officers of MWSS and Manila Water before being deployed to Albay. Sending the team off were PDDG Reynaldo Velasco (Ret. ), MWSS Administrator (back row, 3rd from right); MWSS Board of Trustees Chairman Franklin Demonteverde (back row, 4th from left); MWSS Board of Trustees Member Melchior Acosta, Jr. (back row, 3rd from left); MWSS Deputy Administrator for Engineering and Operations Leonor Cleofas (back row, middle); Manila Water Operations Leadership Team, led by COO Geodino Carpio (back row, 4th from right), and Group Director for Corporate Operations Thomas Mattison (back row, 2nd from left). In light of the health crisis being experienced in evacuation centers in Albay due to lack of safe potable water, water concessionaires Manila Water and Maynilad, led by regulator Metropolitan Waterworks and Sewerage System (MWSS), deployed three units of mobile treatment plants (MTP) to the province currently being affected by the eruption of Mayon Volcano. Manila Water, Maynilad and MWSS sent out one MTP each. The MTPs, expected to arrive in Albay on February 6, will be distributed to serve barangays in Districts 1, 2, and 3, with the following coverage: Maynilad for barangays Tabaco, Malilipot and Sto. Domingo; Manila Water for Legazpi, Daraga and Camalig; and MWSS for Guinobatan and Ligao. Diarrhea cases in the evacuation centers have risen in recent days as a result of shortage of potable water. Just recently, Mayon Volcano Crisis Committee Chair Atty. Francis Tolentino confirmed that the evacuation of affected residents may be prolonged as continued volcanic activity is still being observed in Mayon. “As evacuees continue to be away from their homes, we are hoping that the mobile treatment plants will be able to help ease their discomfort and prevent more of them from getting ill by providing much-needed safe potable water. We commend Manila Water for the timely deployment of MTPs which could avert water-borne diseases or outbreak in evacuation centers,” said MWSS Administrator PDDG Reynaldo V. Velasco (Ret.). Manila Water's mobile water treatment plant was placed near Bosay River under the Cagsawa Bridge. Manila Water’s MTP is capable of treating and converting any type of raw water — river water, flood water, even saltwater — into potable drinking water. The treatment facility produces about 3,000 liters of drinking water per hour and can operate optimally up to 12 hours a day. The MTP will be operated by a thirteen-man team from Manila Water composed of members from Water Supply Network (Kenneth Manahan), Fleet Management (Carlo Furiscal, Benigno Acacio, Rolando Tarnate and Roberto Tortoles), Maintenance Services (Angel Paradero and Mark Angelo Paglicawan), Laboratory Services (Oliveren Marquez), Corporate Business Resiliency (Orestes Aquino, SG Wilfredo Benjamin and SG Conrad Gonzaga), Quality Assurance (Edilberto Mercado) and Engineering (Sid Sestoso). Manila Water has been sending its MTP to disaster-stricken areas even outside of Metro Manila to augment potable water supply in evacuation centers. It was deployed to Bantayan Island in Cebu after Typhoon Yolanda hit several provinces in the Visayas in 2013, as well as in Bohol after an earthquake.